In a large skillet over medium heat, brown sausage for 4 to 6 minutes, or until cooked through, stirring until small crumbles form. Drain fat if needed. Stir in mushrooms and jalapenos, and remove from heat. Preheat oven to 400° F. Coat a large baking sheet with nonstick cooking spray. Unroll dough onto baking sheet and carefully stretch to form a 12 to 14-in circle. 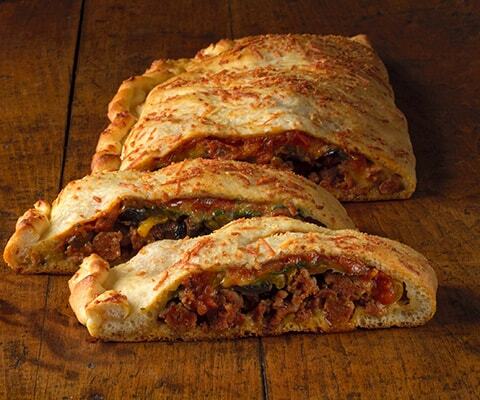 Layer meat mixture and shredded cheese on one half of crust, leaving 1-in. around the edge. Spoon half of Pasta Sauce on top, reserving other half for dipping sauce. Gently fold crust over the filling. Seal the edges by crimping with fingertips or pressing with a fork. Cut 2 to 3 slits on top of crust. Brush crust with milk and sprinkle with Parmesan cheese. Bake for 20 to 25 minutes, or until crust is golden brown. Let stand for 5 minutes. Slice into 6 wedges and serve with reserved Pasta Sauce.